In this lecture/workshop at Oxford Town Hall on 3 October 2017, Chloe Metcalfe – a researcher from Roehampton University presented ‘When non-dancers dance: considerations of audience and performer in contemporary British community-dance events.’ She also taught a dance to the audience, and played violin accompaniment as they danced. ‘Community dance’ emerged in the late 1940s says Chloe Metcalfe. It can create community cohesion she says, recalling an interview with a participant of a barn dance at a trade union conference. The participant said that people would dance together who’d normally not talk to each other- presumably due to the factional nature of the organisation. A feature of these community dances, is that there is a caller who guides and instructs – usually via a microphone – participants in the dance. It’s a ‘called dance’, in contrast to Balkan folk dance where people copy dancers. 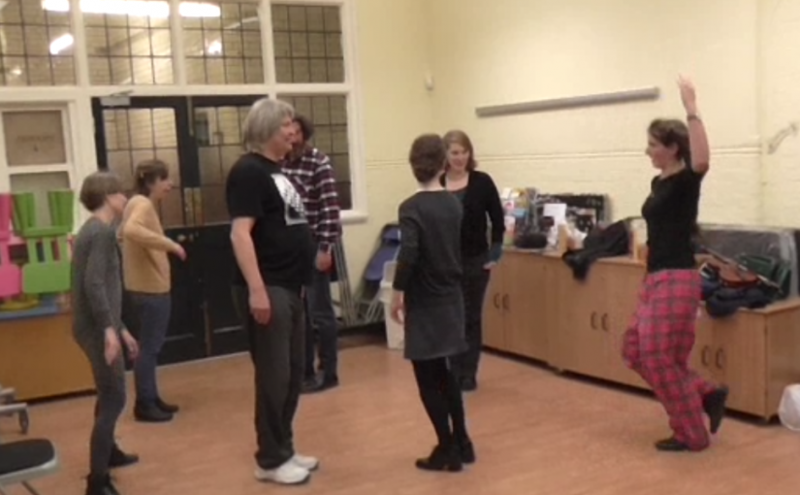 Both contact improvisation and community barn dancing are folk dances. They also share another characteristic in that, the spectators are – or potentially are – both the audience and the dancers, and indeed also a dancing audience too! This is something which academic Heike Pourian mentioned in a lecture about contact improvisation, refering to it as ‘story of separation; story of interbeing’. Simply stated: ritual dances are sword dances, and social dancing is everything else. Folk historian Cecil Sharp said that social dancing was ‘simple’, ‘easily learned’ and ‘without difficulty’. However, he only collected 18 dances from villages although he collected thousands of folk songs. In the 1950’s, there were Community Dance Manuals which aimed to move dancing out of gymslips and plimsolls to social dancing. Although nowadays, many won’t use these dances as they are considered too complex. In the 1970’s, Saturday night dances and Parent Teacher Associations were hubs for barn dancing. Chloe considers how the audience and the spectators of the dance, are related to the dancing – the interchange between them; the spaces where this happens or not (safe havens like the bar or kitchen); and the flow of participants/dancers. She examines gender roles at the dances even though it’s a called dance and not a lead dance. Sometimes, the caller might say ‘bring your lady to the floor’ for example. The lecture ends with Chloe Metcalfe (red checker trousers) teaching a dance to the audience of her lecture. Chloe Metcalfe plays violin as the audience dance at her lecture. Extracts from International Encyclopedia of Dance under Social Dance from the International Encyclopaedia of Dance (see bibliography above).